Near Tuscaloosa in the town of Holt, Alabama, lives Johnny Shines, a man who represents what seems to be a disappearing generation of traditional bluesmen. Born in Memphis, Tenn. in 1915, Johnny Shines were brought up in a musical family. His mother's family were all church people, and he remembers there always being music and musical instruments around the house. "There were tambourines, a fiddle, a bass, bones, all kinds of instruments; but we being the youngest of six kids, all the instruments were gone from the house by the time I got old enough to do anything with them." "When I was nine years old I decided I didn't like home, so I left and headed South `til I found myself working in a groundhog sawmill in Louisiana. That was the hardest work I've done in my life." 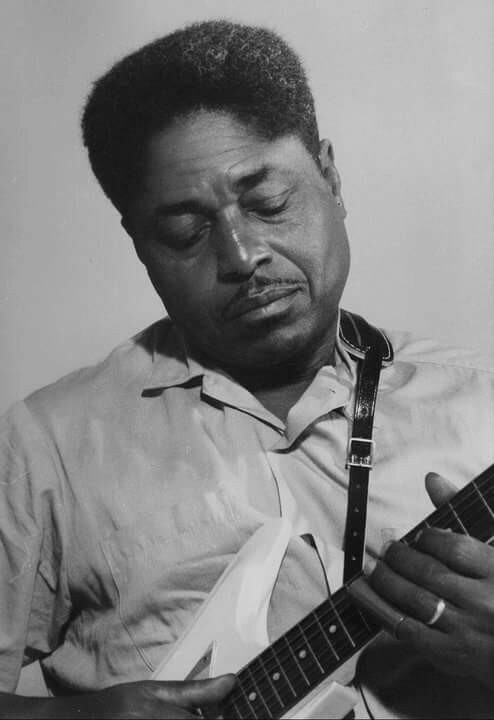 It was in Louisiana that Johnny Shines received his earliest exposure to downhome Mississippi Delta blues. At the age of sixteen he bought his first guitar." It was a six dollar Black Regal. It took me about two months to buy it." He pretty much taught himself to play. "I learned from a lot of people ...Charlie Patton, Son House, my half-brother Willie Reed... Robert Johnson was my biggest influence. One time in Arkansas I was watching Howlin' Wolf play. He stopped playing to go shoot dice and I took that guitar and started playing. Soon I had that whole place howlin'. They started calling me 'Little Wolf.' But Howlin' Wolf said that was the last time he'd leave his guitar' laying where somebody could get ahold of it." In 1934 he met Robert Johnson, and they traveled together for a number of years." Those was rough times. I remember sleeping in corn-cribs... playing in clubs for a dollar a night and all you could drink. You didn't just play for a few hours. You played until they quit dancing. Sometimes we'd play on the street for nickels and dimes." And he remembers tales of his travelling with Robert Johnson. "Once we were near Decatur, Ill. There were only two black people in the town and no one hardly ever saw them, so we were a curiosity. They charged 25 cents for people to just come in and look at us. Robert Johnson died in 1938 in Mississippi. Some people said he'd been voodooed or mojoed or poisoned by a woman. I suspect he died from a stomach ailment. He was an awful heavy drinker." Shines moved to Holt in 1969. In a sense, it was a returning home to Alabama. His ancestors were from near Tuscumbia, and he remembers his grandmother telling him stories of slavery days in that area. Johnny Shines supposes he'll be singing the blues until his dying day.